I enjoyed my very first bowl of Cincinnati Chili at Skyline Chili in Cincinnati many years ago. I had only known a couple of different kinds of Chili at that point, a Texas Orginal Chili and New Mexico Chili, so the introduction of this Chili that could be enjoyed 1 to 5 different ways was very interesting to me. 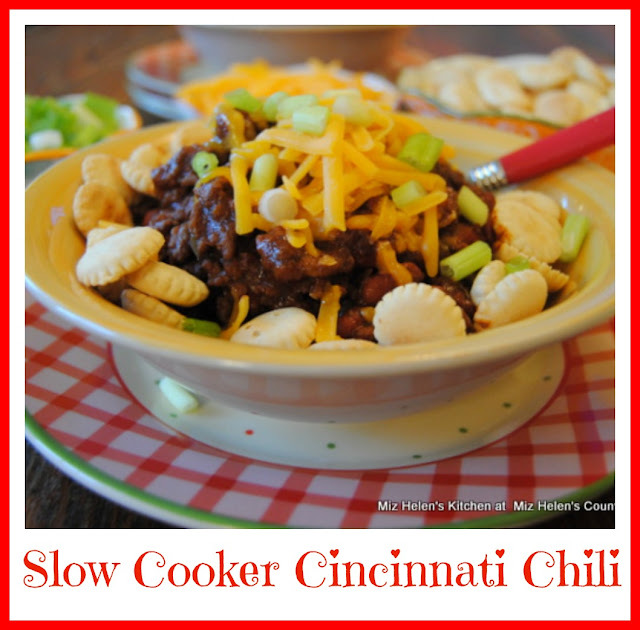 I really fell in love with Cincinnati Chili and have continued to make it through the years, I even have a recipe for it in my cookbook, Miz Helen's Kitchen Table. This recipe today is one that has evolved through the years and one that is a favorite. We call this Cincinnati Chili Nana's Way. In a large hot skillet, brown the ground chuck, add the onions and garlic. Cook until the onions are clear. Add the meat mixture to the pre-heated slow cooker. In a large mixing pitcher, mix the beef broth, tomato sauce, tomato paste, vinegar, cumin, chili powder, cocoa powder, cinnamon, cloves, allspice, salt and pepper, mix together until completely blended. Pour the liquid mixture over the meat mixture and mix well. Stir in the Chili Beans and mix well. Place the lid on the slow cooker and cook on high for 4 hours or low for 6 hours. Cooked Spaghetti for the bottom of each bowl. I Will Sometimes Let It Set Overnight In The Refrigerator and Heat It Up For Serving The Next Day. This Chili is delicious and is a great dish to be served for a family night or a group of friends. I sure hope you enjoy this chili and am so happy that you could stop by and spend some time in the kitchen with me today. Hope you have a great week and come back to see us real soon! Wow that looks so good!! Yes! Mix Helen you know anything with chocolate is good, love this recipe, I will be eating this soon. Happy New Year. *Miz, darn auto correct. Lol. I love Cincinnati style chili, Miz Helen, and have made it myself. However, I'd love to try your version! I'm craving it right now. Also, your carrot salad looks tasty and healthy, too.